Why is solar energy so expensive? I was surprised to find out recently that solar power plants tend to be more expensive than traditional energy plants based on depletable resources like coal and oil. Why is that? It seems as though the main expense of a power plant should be the natural resource being exploited, and the last I heard sunrays are free. This article for example reports in the name of Eran Gartner that solar power is twice as expensive. Why is O&M (operations and maintenance) so high for solar, both photovoltaic and thermal? The initial capital cost of a plant is not the same thing as its lifecycle costs. The best way to analyze the cost impact of an energy source is to look at the total expected costs over the lifetime of the plant, and compare to expected energy generation. This gives you a simple measure that you can use to compare systems. There are three main variables in the lifetime cost of a power source: capital costs (upfront money to build the plant), operations and maintenance (paying to keep the plant operational) and fuel. Obviously, not all plants have fuel costs. The other thing to keep in mind is that the numbers calculated by various groups use various methodologies, and these methodologies are surely tweaked to represent the user's ideological interests. Therefore, it is smart to get the opinion of both ends of the spectrum in our polarized world; the truth probably lies somewhere in the middle. Here is a graphic from the Institute for Energy Research, which is generally aligned with free market energy solutions. However, the underlying data comes from the EIA's 2013 report. The color key has an error where Fixed O&M and Capital cost are swapped. 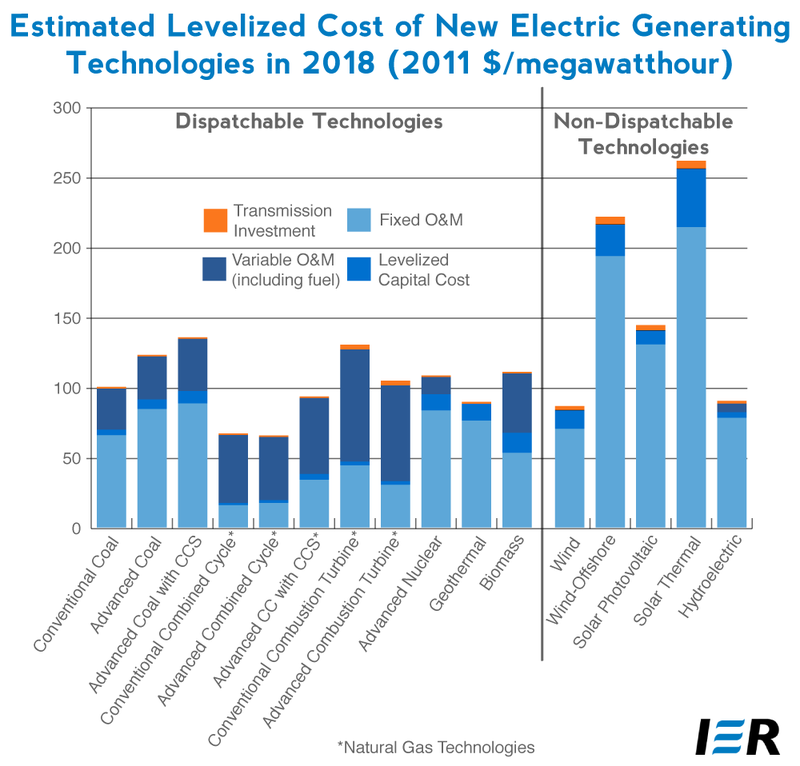 The next set of information comes from Energy Innovation Policy and Technology, LLC; with the underlying data from Lazard's 2014 cost of energy analysis. There was no graphic I could embed, so you'll have to settle for a link. There are three relevant things to point out. Firstly, both data sets are obviously biased for/against renewable energy. While fossil fuel and nuclear costs are similar, there are widely different interpretations of the costs of wind and solar. I'm not particularly interested in attempting to interpret differing methodologies, so lets just say the truth is probably somewhere in the middle. Second, the linked example is Solar Thermal. This type of plant is the most expensive for both lifetime return on the dollar and initial capital investment, for both datasets. Third, given that solar thermal is more expensive, it appears that the quoted statement could be true about solar thermal compared to fossil fuel for initial capital investment according to the Lazard's source, or it could be true about total lifetime levelized cost according to the EIA. So either interpretation could be supported with the data. Really good breakdown in U.S. 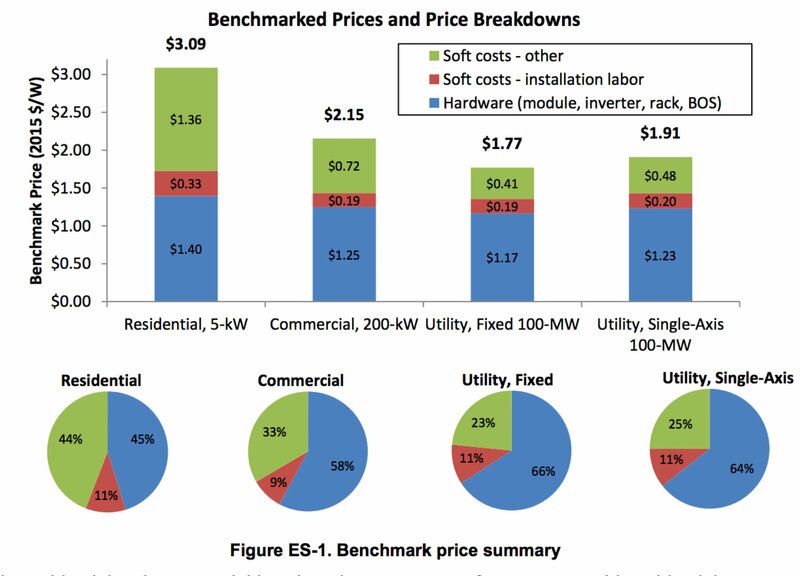 Photovoltaic Prices and Cost Breakdowns: Q1 2015 Benchmarks for Residential, Commercial, and Utility-Scale Systems from National Renewable Energy Laboratory. If you look at the comparisons of utility, commercial and residential solar systems in the report, initial capital costs come out to 58-66% of the costs for solar. The predominant majority of the remaining costs for those sectors is engineering - imagine a panel goes offline, a team has to go out to the site of the plant to fix it (see clarification below). In the residential sector, where the cost of solar is significantly higher ($3.09/W vs $2.15/W for the commercial sector), installation costs are 45% of the total mostly due to the higher costs associated with residential customer acquisition. Also of interest to you, residential solar tends to be much higher in the US than Germany, for example, due not only to subsidies but also looser regulatory frameworks in Germany that speed up installation energytransition.org. Clarification: NREL characterizes commercial and utility soft costs as "EPC (engineering, procurement, and construction) overhead/profit and development costs" (pg v). This does indeed include installation costs associated with installation and planning - exclusive of installation labor and hardware. Later the report characterizes development costs as costs associated throughout project development that typically do not rise with project size (ie development costs are relatively fixed per project regardless of size, pg 26). This suggests system O&M is actually low, or at least not exceptionally high. I would imagine, any reported high O&M solar costs are more implicitly implying high business O&M (customer procurement, engineering, design can be considered business O&M but are associated with project installation). NREL's http://www.nrel.gov/analysis/tech_lcoe_re_cost_est.html corroborates this suggestion. They estimate O&M costs of <1% for solar PV, ~1-2% for wind, ~2% for Combined Cycle Heat and Power (gas), and 0.5-1% for solar thermal. Note, that these percentages are relative to installation capacity for each of the technologies and do include government incentives. Because solar energy is available for only infinitesimally small amount of time. The capacity factor of a solar power plant is 16%, if you place it in a really good area with plenty of sunlight. In boreal climates, the situation is far more worse, with practically no sunshine available during the winter months. If you happen to have a steady load on the electricity grid, 100% - 16% = 84% will need to come from either grid energy storage (very expensive!) or from fossil fuel fired plants. Because we don't have valid uses for the huge amount of electricity available when the sun is shining, typically solar is installed only in such a manner that the electricity produced won't be unused. This means 84% will need to come from other sources. Air conditioning. Unfortunately, in hot climates, you need some air conditioning during the daytime even if it's cloudy. Battery charging. Unfortunately, batteries are extremely expensive. Aluminum production. Unfortunately, the capital costs of the plant are so high that it makes more sense to run it 100% of the time than 16% of the time. Seawater desalination. Unfortunately, the capital costs of the plant are so high that it makes more sense to run it 100% of the time than 16% of the time. Also, the cost of desalinated seawater is so high that major users of fresh water won't be willing to pay the cost. Hydrogen production. Unfortunately, the capital costs of the plant are so high that it makes more sense to run it 100% of the time than 16% of the time. Furthermore, electricity -> hydrogen -> electricity pathway is extremely inefficient. Some other industrial process. Unfortunately, with a good probability, the capital costs of the plant are so high that it makes more sense to run it 100% of the time than 16% of the time. When you're discussing the cost of solar, you're actually discussing 84% the cost of fossil fuels and 16% the cost of solar. Wind power is somewhat better with its 30% capacity factor. Also, even in boreal climates, it is windy during the winter whereas the sun shines only rarely. Battery or hydrogen backed electrical system based on wind looks far more promising than such a system based on solar. Don't also forget that solar requires inverters and professional installation. Actually, today, with the cheap solar panels, inverters and professional installation may cost more than the panels. Not the answer you're looking for? Browse other questions tagged solar-power solar-thermal or ask your own question. Can solar energy be too focused onto a solar cell? Are there solar concentrator builds that work without tracking? How to set up grid-tied photovoltaics without feed-in?